Incase you were dreadfully curious, eventually I succeeded in procuring a pair of My First Fiskars® Scissors from Officeworks. I was trying to decide between those and a pair of Crayola ones. There were advantages that both had. The Crayola ones had a longer cutting length, but the Fiskars ones have a “Spring-like” action and in the end I thought that would make it easier for Abigail (and, eventually, Kristian) while they are learning. Abigail has started to show an interest in the workings of scissors. Previously I have always flat out denied her requests to use some, but I think she is ready to start learning now. 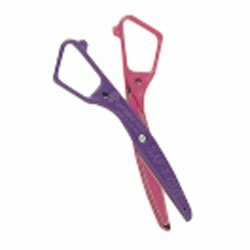 We had a pair of those almost useless plastic encased children’s safety scissors that we got when Stephanie was starting to learn how to use scissors. I was helping her use them the other day and they weren’t working very well (well.. you know, extra less well than they should work!) and upon examination I discovered that they were broken. Worn out. So I’ve been trying to get some more. It’s proving ridiculously difficult. They’re the kind of things you see around everywhere when you’re not looking for them but when you actually want some, forget it. None in the supermarket. None in Big W. None in the newsagent! None in the cheap shop. I’m thinking I may have to go to The Blue Shop to look there, though a look at their website indicates they don’t have exactly the kind that I am looking for but might have some other ones that will be suitable. At, you know, four times the price.